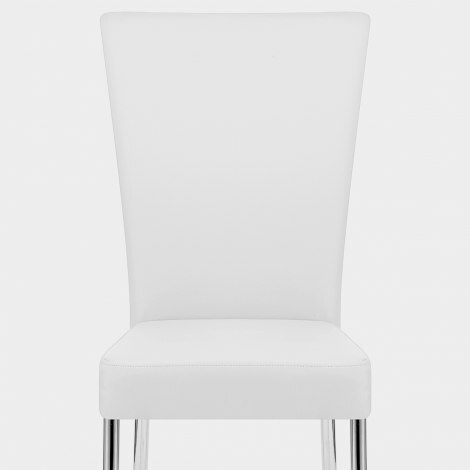 Fashionable in any home, the Picasso Dining Chair White is a design that works well with a number of different decors. Delivering a modern feel whilst remaining comfortable and complementary, the Picasso is a fashionable choice for the dining room. The seat is covered in luxurious white faux leather and includes dense foam padding which adds comfort. Additionally, the design boasts a distinctive high backrest that enables consistent support. Four chrome plated legs ensure stability, and give a minimalist look that really adds character. With protective pads beneath each of the legs, the perfect Picasso is suitable for use on all surfaces. "Classy looking and very comfortable"
The chairs are fab value and look elegant and stylish. Easy to put together. We have been using our new Picasso chairs for a month or so now. Have to say they are very smart and comfortable. We are very pleased with the quality and the prompt delivery. These chairs are beautiful and really finish off our kitchen/diner. They are very comfortable and the assembly was very easy. Additionally, the ordering and delivery process was very pleasant. Just took delivery of 4 white Picasso chairs to go with my new grey high gloss kitchen and white high gloss round table. They are perfect in every way. They look classy and much more expensive than they were. Just a pity you don't do them in grey. This company is fantastic free delivery and Andy the driver who brought them is such a cheerful chap. Can't praise this company or these chairs enough. 5 star service and quality.